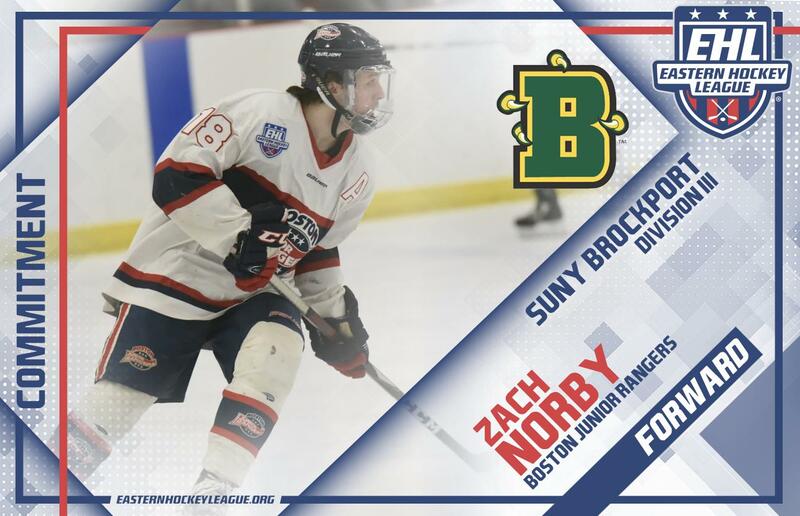 TEWKSBURY, MA -- The Boston Jr. Rangers are pleased to announce that Zach Norby has committed to SUNY Brockport for the fall of 2019. The '98 native of Bristow, VA spent the last three seasons with the Rangers organization, playing at both the Eastern Hockey League (EHL) and the Eastern Hockey League Premier (EHLP) levels. "We are very proud to announce Zach's commitment to Brockport,” said EHL head coach and general manager Rich DeCaprio, “Having recruited him 3 years ago, and seeing the strides he’s made not only as a player but as a human, has been very rewarding as a coach. He has been a great teammate and very easy player to coach. His skill set and IQ are well above average and his perseverance is right there as well. Zach will have a great college career." Looking back at Norby's first season with the Rangers, and he played a key role on the 2016-17 EHLP team that reached the finals. That season Norby scored 20 goals and dished out 30 assists in 48 total games. Following that season, Norby went on to spend the past two years with the Rangers' top team, tallying 82 points in 107 career games in the EHL. Overall, Norby put together a solid three-year career with the Rangers, and for that he is very grateful.